Time to start potty training using the "Misty Method"
The Misty Method is for the breeders home only, from 3 to 9 weeks. It teaches the dog that there is a designated spot to potty making it easier for the new owner to potty train their new puppy. Contrary to some beliefs, potty training a puppy should start with the breeder very early in life. It is very important at 3 to 3.5 weeks old, when the pups become mobile and start to potty on their own, to set their room up PROPERLY. It is not really a natural thing for a dog to pee or poop in his crate. Wolf mothers are meticulous about keeping the "nest" very clean. So, once a baby starts eating solid food, and the mother no longer cleans it up because it can walk at this point too (at this point the mama wolf and den mates would have trained the pups to eliminate outside the den), it is up to the BREEDER to keep the box/nest very clean. This causes an aversion to poop and pee. When this is done right, by the time the buyer purchases the pup, he will already be ready to not pee in his crate or bed, as they do not pee or poop where they eat or where they sleep. So believe it or not, what goes on from the time of birth to the time you buy the pup plays a big role on the young life and what a buyer will be faced with. With this in mind, a breeder named Bev Dorma from MistyTrails Havanese/Mastiffs has created a method called the "Misty Method." It is basically a way of raising the pups that gives them a concept of housetraining at an early age. This in return not only helps the breeder keep the whelping area clean, it makes the puppy easier to housebreak once they go to their new homes. A win-win for everyone.... Within these pages she explains step-by-step how the method works. This means there are a designated potty area, a place to eat and play, and a place to sleep. You can see that I have now changed the room around, and have made it bigger. The potty area should be the farthest away, as when you enter the room, they all jump at you, and want up, and you do not want them jumping in their poop. The bed area should be nearest to where you enter the room. 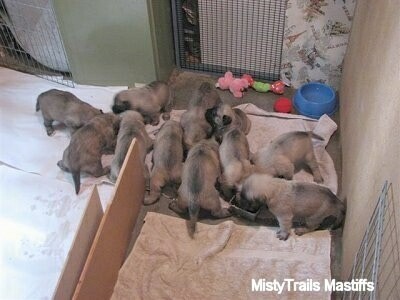 These puppies are all gathered in the play/eating area enjoying their dinner. The pups decide to take a nap and many of them, on their own, gather into the sleeping area. If you look to the left, on the paper, you can see that many have gone over there to pee before going for a nap. 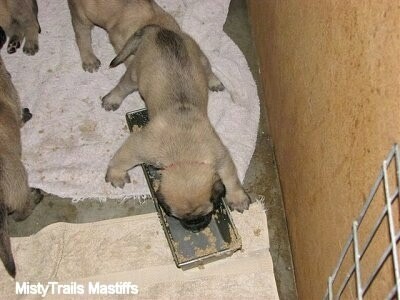 After puppies eat, they naturally feel the need to eliminate. This good little puppy has left the play/eating area and made his way into the potty area to do his business. What a good puppy! This is the first step toward potting training a puppy. Potty training should start with the breeder. 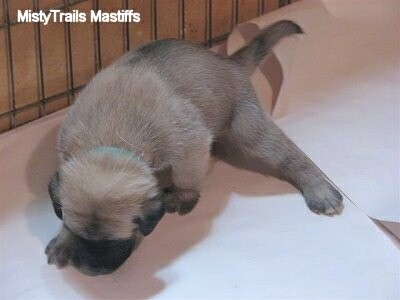 This type of raising a puppy is called the Misty Method and is a regular practice of MistyTrails Mastiffs/Havanese. Puppies raised using this method are easier to housebreak and have fewer accidents in the house, as you are distilling the concept of housebreaking to them at a very young age. They learn from the start there is a place to sleep, a place to play, a place to eat and a place to eliminate and they will carry this concept with them after they leave the breeder. Puppies who are raised in cages where the areas are not separated do not understand this concept. They learn they can eliminate anywhere they wish at any time they wish. Then, after you take them home, you suddenly expect them to understand they cannot pee and poo in the house. Above, puppy pee. The potty area is lined with long sheets of paper that can be rolled up for easy cleanup. This is roll ends of newsprint. Newspaper does work, but the ink can transfer onto the dogs and for white pups this is not good. Soon, I may change to wood chips, BUT NOT CEDAR CHIPS. I like to wait till they are four to five weeks old. I NEVER use kitty litter for puppies; that only works for cats. For large-breed dogs, pine shavings work, but not for the small breeds. For small breeds, paper or puppy pads are best and you may need to weight it down, so they don't shred it, and if they try and shred it, you just have to say "NO." 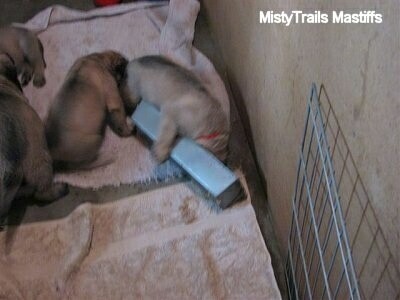 They usually don't start to shred their bedding until they are seven weeks old. 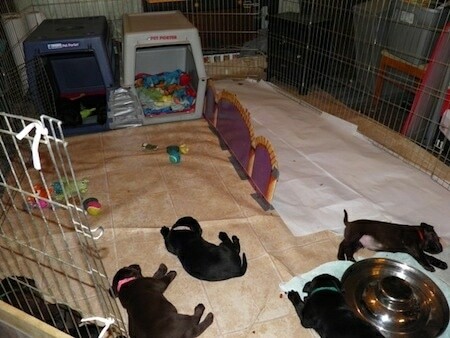 At 3½ weeks, the pups were all sleeping, due to eat in a half hour. Upon waking, ALL of the pups went from their sleeping area to the potty area to poop/pee. I cover the poop with a small piece of paper so the others do not walk in it. These pups are only 3½ weeks old and they already get the concept of housebreaking. The place where you sleep and the place where you play are not the same place you poop and pee. As a result, the owners of these pups will have an easier time housetraining their new puppy. For large breeds, at 2½ to 3 weeks the paper MUST be right outside the door. For small breeds, at 3 to 3½ weeks the paper MUST be right outside the door. THEN, you can move the potty area farther and farther away from the bed. Pups like it at opposite end. When they are 3 to 4 weeks, they will come out of their bed and pee right away, sometimes they only get their front feet out. After they are more mobile, you move the potty away from the bed area. I will line a litter box with paper, but not litter. Ideally at 6 to 7 weeks old, you will have an 8 x 10' area for small breeds or a larger area for large breeds with a bed in one corner, and food and potty at opposite sides of the pen. Note: The stools should never be soft, and never be mushy. If they are soft or mushy (pudding-like) ask the vet for enough wormer to worm all the puppies and mom. Take a stool sample in for testing. The stool shouldn't smell horribly bad. If the stool is not solid and it smells horrible, you want to check for stool Coccidia (coccidiosis). Loose stools also make the job of cleaning up after your pups ten times harder. Stools should be like little chocolate bars. It is normal to have bouts of soft stool, but do not let it continue on an ongoing basis. Find out why, and get them solid again. Otherwise, they will run through it, and it becomes a real mess as they track it everywhere. After about 8, 9, 10 weeks of age, or when the puppy arrives at it's new home, the dog should be taught to go potty outside. Do not have paper or potty pads inside your home. Peeing is for outside only, or you are teaching your new pup it is okay to potty inside your home. Do not use treats when potty training as it takes the dog's focus off of the business at hand and puts it on the food. You do not want the dog's brain to be on food when it is time to relieve itself. This often causes a dog to not completely finish eliminating because the dog is looking and waiting for food. The dog will often come back inside the home and go to the bathroom again after just being out. Keep the focus on the task at hand. Rewards for pottying should be the relief the dog feels when it empties itself, your happiness that the dog did the right thing, along with verbal praise, a pet and/or back scratch. Dogs can feel when the humans are happy. Do NOT use the Misty Method for older puppies. 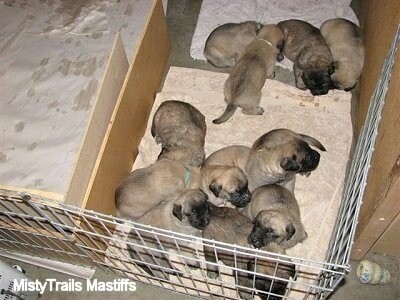 This method is only for pups 3 to 8 weeks of age who have not yet left the breeder. What if my pups are still eliminating both urine and feces in the sleeping/playing area? Sleep area should NEVER have feces in it, you have to start changing that bedding every hour if needed. If a puppy poops, you cannot just pick it up, as the smell will remain. Also, if they walk in the poop, and then walk on their bedding, they have put feces smell on the blankets, so I also cover the poop with a small piece of paper so the others do not walk in it. Mom continues to eat the elimination matter and my pups are four weeks old, is this normal? Yes, this is normal. 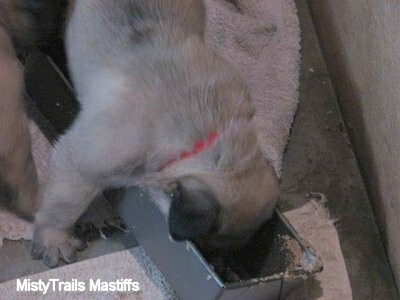 Some dams quit the second you start to feed the puppies; others can continue for a week. This is why I personally do not use pee pads. I use un-inked roll ends of paper, and every time a puppy poops, I cover it. For large breeds I use the shavings, because if a puppy gets feces on his feet, and tracks that smell into the bed or play area, another puppy will smell it, and eliminate there. A WEEK of constant supervision and you have them trained, and if you do not, you have weeks of overload work ahead of you. I would put in a couple crates with clean bedding, and have the rest paper. NO play area on the first day of potty training. Then slowly make a play area, each day making it a little bigger...and clean the floor every hour. I cover the used ones up as fast as I can. The problem with the pee pads is they are plastic on the bottom, so when you cover up the one below, you are adding a nice smelling fresh pad…YOU DON'T WANT THIS. You want the potty area to smell like a potty, yuck for a few days, and you want bedding area to smell clean. Just a guess of what is happening is this: pups eliminate on a pee pad and step in it, and then track the smell to play area and bed. Then you put a fresh pee pad on top of the old one, and now the pee pad smells good, and the bed smells like pee/poop. I am looking for one of those weaning bras for my dog and can't find them anywhere. Where do you get them? For small dogs you can use a human baby onesies suit. For the bigger dogs, you need to get a t-shirt, fairly large, and then you buy a bed sheet clamping holder (sheet straps). They are about six inches long, and they sell them in the store, to put on the corner of flat sheets in order to turn them into fitted sheets. They are elasticized. They have the clamps on the end, like ladies used to wear to hold their stockings up. You just cinch the t-shirt on with them, but it may be hard to cover the bottom two teats. At six weeks, the puppies do very well eliminating where they are supposed to MOST of the time. However, they don't have a complete aversion to mess. I routinely see them spending time in the potty area sleeping or chewing a toy or playing with another puppy that is in there to "go." This happens. I put up a barricade by taking two pieces of thick plywood and making a CORNER to put in front of the potty entrance. It is portable and I put it over the paper. It acts as a paper weight, so they cannot drag the paper and when they are playing, they run, and hit the wall, and don't play on the paper. And by 6.5 weeks old, they KNOW where the paper is; they can learn to walk an extra two feet and around the corner to get into the potty area. It works awesome. Still the odd one goes in there to play. I have four-week-old puppies. How long does it take them to figure out to go to the pee pads? I have had it there for five days and it is hit and miss, still peeing on sleeping area. You don't want them to pee on their sleeping area. Ideally you catch them before they start, and then it takes about three or four days of being extremely consistent and changing the bedding as soon as one has a boo-boo. After three days of fresh-smelling bedding and paper that smells like pee, they get it. I do not have much luck with pee pads. They don't work as well as the un-inked paper. I find, with the un-inked paper, you can cover the paper with another piece of paper, and cover the poop and pee, leaving the scent of pee, without them tracking it back to their bed. BUT, if you put a pee pad over a pee pad, it masks the scent. If you can get a pee pad with just pee, and pick up the poop but leave skid marks, it may work. I just find that leaving the bed smelling fresh and the potty area clean but smelling of pee helps for the first four days, just till they get it; they do not pee in their bed, and if they step on the pee pad and it is saturated, and their feet get covered in pee, they track it too their bed. Wake them up every couple hours and put them out on the paper: don't let them back into the bed area until they pee ON the paper. I have 5.5-week-old puppies. They are really, really noisy at night lately. Is there anything I can do? They literally yell for what seems like hours. They are likely hungry and mom is likely not wanting to go feed them at night. She should but they have teeth, so you need to give them a big meal at bedtime, and a good late play. Then to bed. The lights out with no stimulation. Make it so their room is BED and potty area ONLY. This is the harder stage and a reason puppy mills and backyard breeders want to let the pups go at 5.5 to 6.5 weeks, but you cannot. This is a learning stage for them. The play area stays during the day and you slowly make it bigger, but you can take it away at night to teach them night is for sleeping. "I used your Misty Method for potty training 11 Lab puppies. I started at 2.5 weeks. It took about 2 days with NO ACCIDENTS!!!! They are five weeks old now! I had a whelping box in the area until yesterday. I wanted the puppies that are getting crate trained to get used to crates so they were not scared when they go to their forever homes. Your method is AWESOME! I used many tips of yours throughout Sasha's pregnancy and whelping. THANK YOU!!"